Labour has launched its manifesto, For the Many, Not the Few. The full document is available online. Here are the main things you need to know. A programme providing a "stark choice" at the election - to stop the system being "rigged against" the many and to "build a country where we invest our wealth to give everyone the best chance". Jeremy Corbyn's foreword says: "Let's build a fairer Britain where no one is held back. A country where everybody is able to get on in life, to have security at work and at home, to be decently paid for the work they do, and to live their lives with the dignity they deserve." Nationalisation of England's nine water companies. Deliver rail electrification "including in Wales and the South West". Reverse the privatisation of Royal Mail "at the earliest opportunity"
Chris Cook, BBC Newsnight policy editor, says: "Capping rail fares (through public ownership); that has a very simple consequence - it costs you money - but that money isn't mentioned in the document. "It's important to point out, though, that it's hard to be in Opposition, especially in the case of a snap election. Labour doesn't have the civil service to do the sums for them and it shows." An end to zero-hours contracts to guarantee workers a "number of hours each week"
Raise minimum wage to "at least £10 per hour by 2020"
Branwen Jeffreys, BBC News education editor, says: "Increasing entitlement to childcare as set out in the Labour manifesto would cost an additional £5.3bn - this is based on research published last year by the Joseph Rowntree Trust on what an "anti-poverty childcare system would look like". "The manifesto suggests moving away from a complex system of tax and benefit subsidies to parents and towards direct subsidies to childcare providers. "There are plenty of questions, though, including whether Labour intends to provide free childcare for even the wealthiest children - the Conservative promise of 30 hours free a week doesn't apply to families where one parent earns more than £100,000." One million people will be taken off NHS waiting lists by "guaranteeing access to treatment within 18 weeks"
Cuts to bereavement support payment will be scrapped, as will the bedroom tax and the "punitive sanctions regime"
A commitment to "protect the pensions of UK citizens living overseas in the EU or further afield". Martha Kearney, presenter, The World At One, says: "The pension age is due to rise to 66 by the end of 2020. Labour rejects the Conservatives' proposal to increase the state pension age even further. "On The World at One the shadow business secretary Rebecca Long-Bailey told me that there would be a review of that. "That could be an expensive one. The former pensions minister Steve Webb wrote in a recent article that assuming a flat rate pension of £8,000 per year in today's money, that would cost £93.6 bn." Nuclear power "will continue to be part of the UK energy supply"
Maintaining access to the EU's internal energy market and retaining access to nuclear research programme Euratom will be a priority in Brexit negotiations. Guarantee help to buy funding until 2027 and give locals buying their first home "first dibs on new homes built in their area"
Legislate to ban letting agency fees for tenants, and look at giving the Mayor of London power to give London renters "additional security"
Build Crossrail 2 - to run north-south through London between Hertfordshire and Surrey - "to ensure our capital continues to prosper"
Recognise the need for additional airport capacity in the South East (but there's no mention of Heathrow). Work with international partners and the UN on multilateral disarmament "to create a nuclear-free world"
Labour will not "scapegoat migrants" and will not set a cap on immigration, describing targets as "bogus"
International students will not be included in immigration numbers, but the party will crack down on "fake colleges". Labour believes in the "reasonable management of migration" but "will not make false promises on immigration numbers". Reject no deal as a viable option and if needs be negotiate transitional arrangements "to avoid a cliff-edge for the UK economy"
Will not allow Brexit to be used as an excuse to undercut UK farmers and flood Britain's food chain with cheap and inferior produce. Media captionJeremy Corbyn: "This is a manifesto for all generations. We are providing hope and genuine opportunity for everybody"
Labour chose Bradford University to launch its 2017 manifesto. 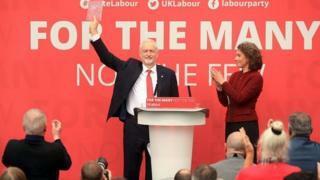 The Farm's 1990s anthem All Together Now - popular at football grounds over recent years - played out as Jeremy Corbyn and his team were brought to the platform amid a standing ovation chanting "Corbyn". Shadow cabinet minister Sarah Champion introduced the event, describing the Labour leader as "Britain's next prime minister". 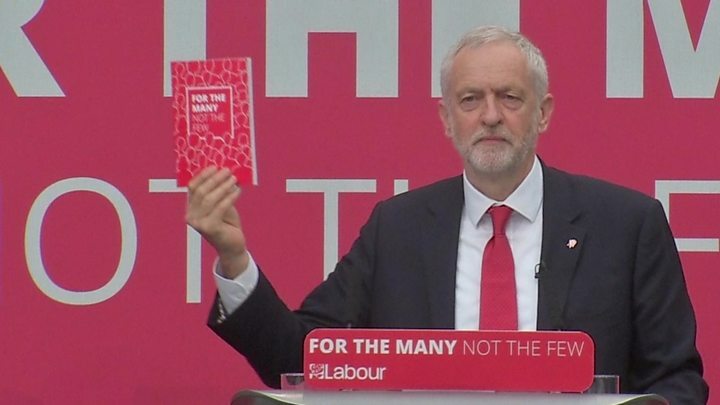 Speaking in front of a banner that read "For the many, not the few", surrounded by his shadow cabinet, Mr Corbyn said: "Our country will only work for the many not the few if opportunity is in the hands of the many. So our manifesto is a plan for everyone to have a fair chance to get on in life, because our country will only succeed when everyone succeeds." Jeremy Corbyn told the lively audience at Bradford: "This manifesto is a draft for a better future for our country - it's a blueprint of what Britain can be and a pledge for the difference Labour can and will make. "This is a manifesto for all generations - we're providing hope and genuine opportunity for everybody. I say to our children, whatever the post code you were born in, you will have the same chance as any other child." Conservative Chief Secretary to the Treasury David Gauke: "Jeremy Corbyn's nonsensical ideas simply don't add up - and every single working family in this country would pay for Corbyn's chaos with higher taxes. It's clear that proposal after proposal in this manifesto will mean more borrowing and debt... It is simply not worth taking the risk of this shambles being in charge of our economy and our Brexit negotiations in three weeks' time." SNP deputy leader Angus Robertson: "Scrapping hospital parking charges, free tuition, publicly-owned water, ending the bedroom tax, increasing renewable energy and expanding free childcare will all seem familiar to voters in Scotland - because they are already happening under an SNP government... No amount of headline-chasing policy announcements can paper over the enormous cracks within the weak and divided Labour party." Former Lib Dem cabinet minister Alistair Carmichael: "In the biggest fight for the future of our country in a generation, Jeremy Corbyn's Labour let you down by voting with Theresa May on Brexit - not against her... Now they are failing to stand up for our membership of the single market and refusing to give you the final say over the Brexit deal." Green party co-leader Jonathan Bartley: "Labour is trying to be all things to all people and failing. You can't pour money into Hinkley and create a renewable energy revolution. You can't solve the air pollution crisis while expanding airports and roads. You can't be a peace builder while renewing Trident. You can't transition to a new economic model while hanging onto 20th century ideas where growth is the only answer. It's time Labour embraced our full vision for the future instead of cherry picking a few good Green policies, then contradicting them." Plaid Cymru leader Leanne Wood: "Labour has shown they are too divided. Their MPs in Wales are just queuing up to stab their leader in the back, so it's up to Plaid Cymru MPs to defend the Welsh national interest." UKIP leader Paul Nuttall: "Labour has announced plans that are intended to tackle the decline of pubs however, they will do anything but that. Their plans demonstrate a complete lack of joined up thinking. Whilst guaranteeing to list all pubs as assets of community value to help stop them being sold off to supermarket chains and the like is laudable, when combined with an refusal to rule out a rise in beer duty it is nothing but an empty gesture." Paul Johnson, Institute of Fiscal Studies: "They're suggesting a £50bn increase in tax which, it were to be implemented by the way, would take the tax burden in this country to the highest level it's been in about 70 years. But actually, there's an awful lot of uncertainty about whether you can actually raise that amount of tax. They are talking about very, very large increases in taxes on companies which would likely reduce the amount of investment that they do. I think the actual amount you could get from these policies certainly runs into the tens of billions, but probably doesn't reach the £50bn that Labour are claiming." CBI director general Carolyn Fairbairn: "Labour's proposals taken as a whole prioritise state intervention over enterprise, and fail to offer the pro-growth and competitiveness agenda the country so badly needs." TUC general secretary Frances O'Grady: "This is an impressive set of pledges from the Labour Party. Their commitments to improve workers' rights and drive up wages would make a real difference to millions of workers. There's clearly a growing political consensus to address issues affecting working people. Decent jobs and fair pay must top of the list for the new government." British Chamber of Commerce director general Adam Marshall: "High personal taxation, sweeping nationalisation and deep intervention in business decision-making are not the hallmarks of an ambitious and enterprising society. Taken together, some of the headline propositions in the Labour Party manifesto will give business communities across the UK real cause for concern." Stephen Martin, director general of the Institute of Directors: "Some areas Labour have identified, such as the importance of a sensible immigration policy and investment in infrastructure, are clearly in the country's economic interests. But other policies, like banning zero hour contracts, or introducing pay ratios for companies with government contracts, are worryingly knee-jerk reactions." Unison general secretary Dave Prentis: "Labour has produced a manifesto that delivers for public services. Ending the pay cap will make a huge difference for hard-pressed public sector employees. Proper investment in the NHS and social care will have a huge impact on patients and staff too. When the other parties unveil their manifestos later this week, they would do well to take a leaf out of Labour's book - and stand up for public services and those who work in them." Tim Roache, GMB general secretary: "Labour's manifesto is one that would practically change millions of lives. From social care, to housing, to Sure Start and our NHS - it's a manifesto that makes sense for working people. It's a manifesto about fairness and about helping real people to get by and get on in life. It's not paying lip service to the issues people face, it's taking them head on. The country is crying out for change. This is a manifesto that can deliver it. People need to get out there and vote for it."